In 2013 Magnum brand toner users and participants of Magnum’s Recycling Program made significant progress in environmental savings and reducing landfill waste. Magnum Print Solutions, the largest toner remanufacturer in the Northwest, has redesigned the toner cartridge manufacturing process, optimizing packaging design and recycling efforts to minimize waste and maximize component reuse. To track the impact, Magnum created an online application - ‘Carbon Calculator’ which lists the environmental savings of each element of a toner cartridge including metal, oil, trees, water and greenhouse gases. The Magnum Recycling Program recycles used toner cartridges from businesses throughout the Puget Sound. Magnum provides containers for used cartridges and works with the business to arrange pickup. Participating businesses educate their employees about the impact, and designate areas for the cartridge containers. Companies enrolled in this program include the Fred Hutchinson Research Center, Seattle Cancer Care Alliance as well as locally owned office supply distributors Keeney’s and Chuckals. Seattle had a lot to celebrate this past football season, and the Magnum team was out in full force. Despite the sole Bronco fan who bravely put up with the incessant ribbing; Magnum employees enjoyed the Seahawks success. To celebrate, Magnum flew the 12th Man Flag outside headquarters and delivery drivers handed out Skittles before the big game. 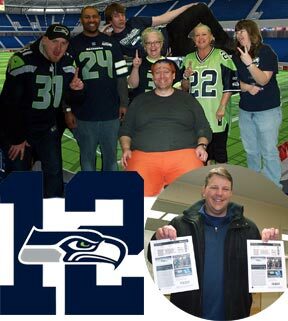 Magnum even came to the aid of a Hawk fan on his way to the Century Link festivities, who needed to print his tickets! Look forward to preseason festivities from Magnum. Go Hawks! Change your Font, Save Millions? CNN recently featured a story about Suvir Mirchandani, a 14-year-old student whose published study detailed how the U.S. federal and state governments could save about $234 million a year by simply switching the type of font used on documents. In the study, Mirchandani, who lives in the Pittsburgh area, said he found that Garamond is the most efficient font for printing, among the fonts recommended for use by the General Services Administration. This is because Garamond uses thinner strokes for its letters, meaning less ink is used on each character. According to the report, if the U.S. government stopped using Times New Roman and Century Gothic and switched to Garamond, it could reduce its annual cost of ink from $467 million per year by more than 29%. That means it would save about $136 million per year. An additional $97 million could be saved if state and local governments made the switch too. Mirchandani conducted his research after being inundated by printed handouts upon starting middle school. Curious to see if there was any way to reduce the costs involved, Mirchandani conducted tests and found that his school district could save $21,000 annually by switching to Garamond. One of the major contributing cost factors in printing is price of toner. Besides using a thinner stroke font, another way to save is to use a high quality remanufactured toner which not only saves on cost but is more sustainable - like Magnum brand toner. Magnum's on Linked In and we'd like to link with you! Click on the icon and "follow" Magnum Print Solutions on Linked In. 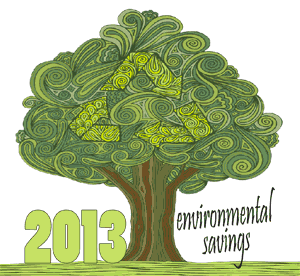 We send information about recycling, printing, special events, activities and promotions.